we spoke about running a game jam and from memory I think @preciousroy was going to run it but his last post was about he had uni coarses and might not get the chance to do it, and as some time has past I thought I would bring it up, so if there is enough interest I will put one together. 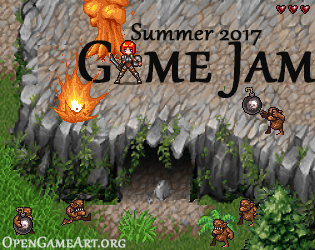 So, schedules-- I went back and looked over the PreciousRoy game jam proposal thread, which suggested we alternate jams and challenges? So... here's how we could schedule it. So these are spaced out more than the original proposal, with consideration for major holidays. We also got hung up on banners last time, which seems silly on one hand, but on the other does make sense. 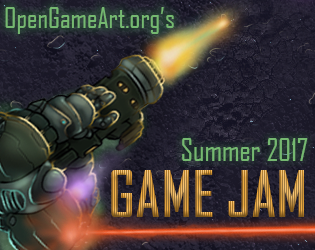 'Game Jam' is a pretty vague topic. I'd rather have a banner to decorate the front page specific to each jam so we don't get used to it, and we'd have a topic / theme to pick from? Speaking of themes / genres-- would picking both at random be acceptible? I'd prefer it, I think. "Make a game in two weeks" is huge and overwhelming. "Genre: platformer; Theme: ghosts!" is way easier? I'm not sure how it will run at the moment, I am taking notes on what has been said so far. There's a bit to consider, so hopefully I can come up with something that will be ok for all that will take part. One thing I'm pretty sure I won't do is a "theme", I'm more for keeping it as open as possible so that all artwork on OGA is considered for a game. Il draft something up and post it soon, I still want to give preciousroy the opportunity to jump on this thread incase he has set one up and ready to go. Anyone have any further thoughts on this? I'd love to hear any ideas anyone else has, too. it does seem it has gone quiet on this, so it does make me wonder whether there is enough interest. but i shall post my proposals of what am thinking of doing soon, I have reached out to PreciousRoy, but i have had no response so he must still be busy doing his masters. if someone wants to do a banner, that would be great, i did do one, so if not il just use that. What're the banner dimensions, for reference? ok heres how im going to do. The Jam will be hosted on Itch.io, which will be a Ranked Jam, so all votes from the criteria will be calculated and totalled automatically. Only those that have submitted and taken part in the jam can vote on entrys, im not sure if it should be the same as the jam itself for the same reasons or just have it at 2 weeks. your thoughts would help. 1) Game must be made from the start of the jam. 2) You must use a minimum of 2 assets from at least 3 categories on OGA. - Derivative's: If the license permits you to create a derivative work of an asset, then you still need to credit the original author, and if you do, then please share it on OGA, it would be cool to see it! 4) Game must not promote any sort of discrimination, such as racism, sexism etc, or political agenda's. Think thats it, all thats left to say is this may not appeal to everyone how i have done this, but it may help as a guidance for when another one is done in the future, not neccessarily by me, perhaps PreciousRoy when he returns, but I don't mind doing it. 315x250 is a WEIRD banner size. ;) But I'll see if I can't whip something up. I might also post something on reddit and such with a link back, once things are finalized. I have to ask about this-- do you mean three assets from at least two categories? >> 2) You must use a minimum of 2 assets from at least 3 categories on OGA. minimum 2 assets from at least 3 catergorys, So 2 from Music, 2 from Sound & 2 from 2D art, or you can have 2 from 3D Art, 2 from Textures, 2 from Concept and so on. Added a fantasy one-- thought I could get away with a sneaky edit. ;) I'm not sure it's good enough, but you can go ahead with that if you want, too. coarse there good enough!, thank you for taking the time to do it. I have now finalised the jam and its ready to go, and start in 12 days. i can still edit it up until it starts so if i share it now i can make last minute changes if neccessary. Looks good. I can help you with some spelling / grammer stuff, if you like. So, the 'don't start until July 1st' thing-- does that include planning? Grammer, if you want me to correct it then let me know where ive made the mistakes, no problem, you kind of have to take me as you find me really, im not that educated, im not that bothered. if you understand it then it should be ok, I'm working on other stuff at the same time so your have to forgive me if its not 100%. well its entirly up to you how you guys & girls want to plan for a jam or do what you feel you need to do, it doesnt start for 10 days and it runs for 4 weeks. I'm talking with a few folks about joining this game jam. Once I hear back from them then I'll sign us up. Hope it happens, looking forward to it. Can someone tell me where I can find the names of the people I'm supposed to credit. I downloaded some assets already and forgot about the credits part since I wasn't even sure if I would be using them. So is there any folder where I can find the names of the people I'm supposed to credit, or will I have to manually find everything? Also, do I have to give credit to the commisioner too? And by the way, are we allowed to download assets before hand? If you were logged in while you downloaded things, there will be a 'collection' on your account with everything you've downloaded. That might make things easier. Crediting usually includes a link to the user's account unless they have attribution instructions in their file. Chasersgaming decided that planning before was all good, so downloading should certainly be fine. :) It'd better be, anyway-- I've been going through my Hyptosis sprite sheets and making organized Unity assets out of them, so it'll be easy to build things when the start gun goes off. Found it! Thanks a lot!